“Hello? Hello, is anyone there?” It’s this lonely cry of desperation that greets you when you first begin escapeVektor. This is the moment that you first meet Vektor, who you soon discover has found himself trapped inside the CPU of your Nintendo 3DS. With no recollection of his past, it naturally falls to you, the player, to aid him in his escape and help regain his lost memories along the way. With its first chapter having originally released through WiiWare back in 2011, Nnooo has crafted the complete experience for Nintendo’s latest handheld, and an especially notable release it is indeed. For me, escapeVektor feels like a wistful homage to gaming days gone by. The game’s retro aesthetic belying a gaming experience that masterfully goes out of its way to outsmart you at every turn. At a concept level, it all appears fairly straightforward. You steer Vektor around a fixed grid, aiming to turn the white lines that border individual cells into your own colour. Once you’ve done the node in entirety, an exit will open and you’ll race toward it to achieve the highest score you can. It feels simple enough at first, the game eases you in before imposing a gradually paced degree of difficulty on the player. The CPU soon detects your escape attempt, suitably placing increasingly challenging obstacles to ensure that Vektor remains trapped within his digitised prison. Patrolling enemies, switch-operated gates, and turrets seek to catch you out, later accompanied by the likes of those that erase your coloured path. escapeVektor is a fast-paced affair, not least due to imposed time limits, but tools at your disposal aid you which include the Boost, Super Boost, Detonate and Boostenate. Such abilities are unlocked and then upgraded through increasing Vektor’s version number, doing so correlating directly with the player’s total score across the entirety of the game. Colouring lines fill your Boost bars, which may be slowly expended to speed your movement around the grid, whereas Detonate grants you the capability of triggering explosions that will destroy nearby enemies. To be able to do so, you must first fill Detonation pips by completely bordering cells, with further pip slots and a broader blast radius becoming available through levelling Vektor. Boostenate becomes the crème de la crème, however, seeing you zipping around the grid at Super Boost speeds whilst also becoming invincible. The downside is that it saps both your Boost Bar and Detonation pips whilst in use, despite how satisfying it is. You’ll inevitably fail nodes multiple times on occasion and mindlessly curse at your 3DS, but that’s the beauty of escapeVektor. Your eventual completion providing those rewarding moments in which the player can immediately sit back and, briefly, bask in their own success. With 150 increasingly challenging Nodes to play through, there’s enough content here that will keep you captivated for hours at a time. There are medals to unlock, achievements to gain, online leaderboards to compete on (by location, score or friends), and second exits that lead to an extensive amount of additional content. Time spent away from playing the game isn’t in vain either, with Vektor hacking the CPU to provide you with further Wildcards. These can also be gathered through natural progression, and are essentially gamble items that allow you to attempt to double your score on any particular node. If you’re feeling especially confident about tackling the node, then use one. But if you fail, the Wildcard will be disposed of. The reward most certainly comes with a risk, but you can easily build a sizeable pool of such cards. The entire package becomes ever the more impressive through Nnooo’s sublime implementation of stereoscopic 3D, which is some of the most striking that we’ve seen on the handheld to date. There’s a real sense of depth here that greatly adds to the game’s immersion for those that favour keeping their 3D Slider up. There are minor gripes, especially in relation to the camera. The player is granted the option to press the R button to zoom out, yet this level of magnification is entirely preferable throughout the entirety of the game. Without it, you can barely gauge your surroundings, which requires you to repeatedly hold the button during play. Your demise can at times feel fairly cheap as well, despite the commendable level of challenge on display, with enemy spawns and timed-gates activating without any obvious caution. Regardless, Nnooo’s latest proves entirely addictive, for sure. 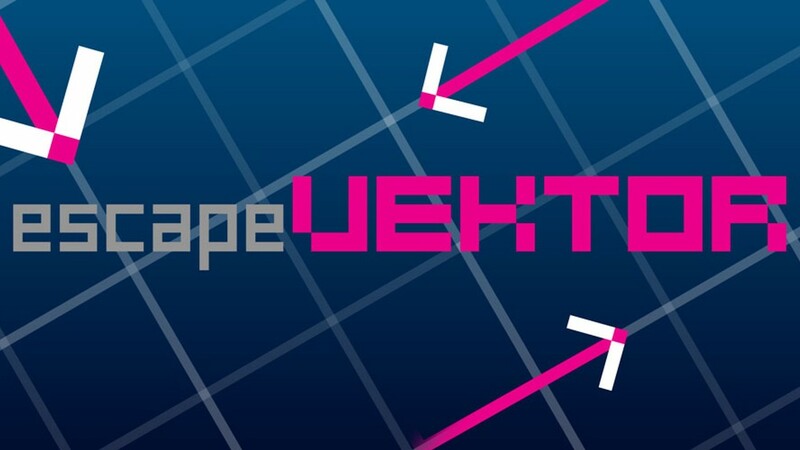 Vibrant, remarkably flawless, and accompanied by an eclectic soundtrack, escapeVektor delivers a refreshing experience on Nintendo eShop.